2008: The Year of Federalism in Iraq? In all the speculation about the fate of the US “surge” policy in Iraq, many analysts have overlooked a date on the 2008 calendar which is bound to become fateful: 11 April. On that day, the current moratorium on creating new federal entities – a last-minute addition to the Iraqi federalism legislation in October 2006 – comes to an end. From April 2008 onwards, the administrative map of Iraq could change dramatically… Full story here. 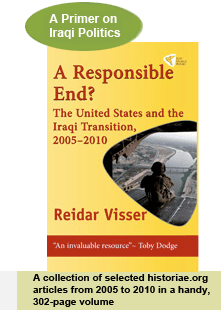 Posted in Basra and southern regionalism, Iraqi constitutional issues | Comments Off on 2008: The Year of Federalism in Iraq?